It is known that on open doorways with two adjacent areas in different conditions the air is interchanged between them because the laws of physics tend to equalise the temperature and pressure difference between both sides. 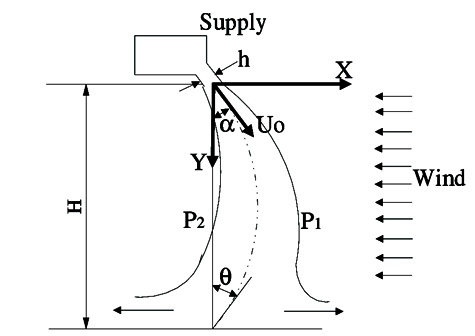 Schematic representation of the main parameters involved in the performance of an air curtain produced by the UPC (Polytechnic University of Catalonia). The efficiency of an air curtain depends on the optimization of performance factors. Fan type: axial, tangential wheel, centrifugal, etc. Higher pressure fans create a higher pressure jet that reaches farther. For instance, if we compare an air curtain with tangential fan against an air curtain with centrifugal fan (with same air volume), the jet made of centrifugal fans will be stronger and larger. UPC University air curtain studies have proven that air turbulences are one of the most important parameters that will affect the distance of the air jet. Optimized shape of the outlet plenum, the position and fans type, the shape of lamellas, etc. substantially affects the air jet performance. Tests and University studies have proven that the angle discharge helps substantially helps the air curtain to be more efficient. 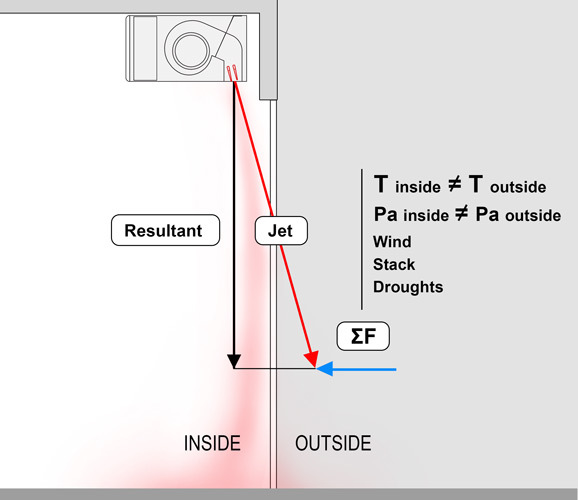 When factors like wind, temperature or pressure difference causes air transfer from outside to inside, we can aim the jet towards outside some degree. Then the jet direction against the air entrance will help to keep the air outside. The trajectory of the jet will be parabolic but at the end will reach the floor approximate by the doorway. If we can’t adjust the angle discharge, the jet will be pushed in by the external air forces. The forces parallelogram theory explains how the forces behave on a doorway. The following diagrams show the difference between air curtains with fixed lamellas against adjustable ones. (1) The first one, fixed vanes, where the entrance air velocity pushes the jet of the air curtain, the resultant of the parallelogram of forces is diverted inwards. This allows outside air to enter inside. (2) The second one, adjustable lamellas, when the air jet is oriented against the entrance, the resultant of the parallelogram forces is directed perpendicularly to the floor. 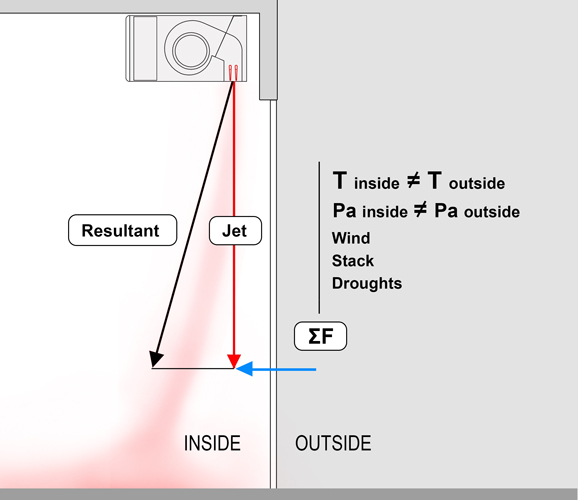 This means that outside air does not enter and inside air does not escape. Besides internal temperature level is maintained.